American consumption of dairy has devastating environmental consequences, including polluted water, substantial greenhouse gas emissions and degraded land and habitat. Have a positive impact on wildlife and the planet by consuming less dairy. In 2015, 9,317,000 U.S. dairy cows produced more than 208 billion pounds of milk.1 Americans consume more processed dairy products, such as cheese and yogurt, than ever before. Per capita cheese availability has more than doubled since the 1970s, and Americans now eat 36 pounds of cheese every year, in addition to 22.8 pounds of frozen dairy desserts, 14.9 pounds of yogurt and 5.5 pounds of butter per person. Consider that it takes nearly 9 pounds of milk to make one pound of cheese — this helps explain why per capita dairy consumption of uid milk equivalents increased from 539 pounds of uid milk per year in 1975 to 614 pounds (about 9,141 cups of milk) in 2014. Just accounting for direct uid milk consumption, Americans drink about 296 cups per capita of uid milk each year. This dietary choice has a big impact on the planet — adding up to an annual per-person cost of approximately 296 pounds of carbon dioxide equivalents (CO2e)5, 3789 ft2 habitat, 7045 gallons of water and 237 pounds of manure. 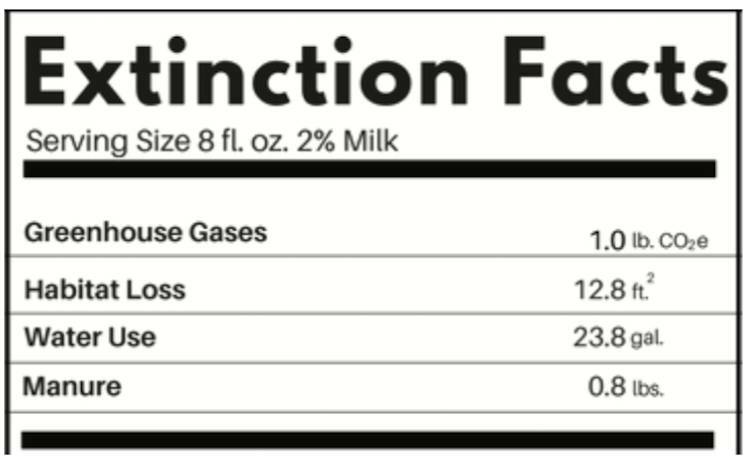 PLEASE DOWNLOAD the PDF for more realities about the environmental costs of big dairy.